All three RIP titles into one exciting and heart-pounding pack! 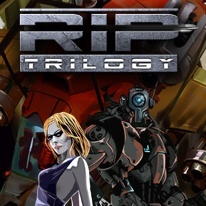 RIP – Trilogy brings all three RIP titles into one exciting and heart-pounding pack. RIP Not afraid of Death? What if he is accompanied by Halloween and Rock-N-Roll? Play the part of these antiheroes and go to war in this all-out action experience! Each character has their own strengths and skills, but this is not a game for the faint of heart. With over 40 levels to RIP through, the results are murderous! RIP2 – Strike Back Your favorite antiheroes are here to strike back with another score to settle. Death, Halloween and Rock-N-Roll...each character has his own strengths and skills, so pick one and start shooting. In Story Mode, you'll fight through 60 furious levels using an arsenal of upgradeable weapons, tanks, helicopters and turrets or for a quick adrenaline fix, play Rush Mode and see how long you can last.